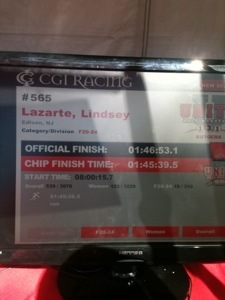 I’d like to start by saying that this is extremely exciting for me to document, as it is my FIRST official race report of 2013. Technically, this is my first race report ever being that I’ve never written a race report before. Nonetheless, I hope that I can keep this tradition going. Okay, so I guess I lied about my last long run being the 8-miler I did two Saturdays ago. 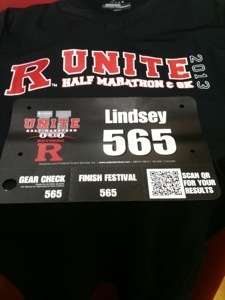 I actually did an 8-miler 3 days later…and then I ran the Rutgers Unite Half Marathon yesterday. Sorry guys! Anyways…yesterday was exactly what I needed to boost my confidence and really get myself psyched for the Big Sur Marathon which I will be running in exactly 5 days. Yikes. This past weekend, my main focus was to stay calm and keep my nerves at bay before my race on Sunday. All weekend, I stayed home and just spent time with my family. I kept reminding myself that this was just a warm-up race, to not take it seriously, and to just have fun. I kept the mentality that this race would be just like any other long run I’ve done in my training. 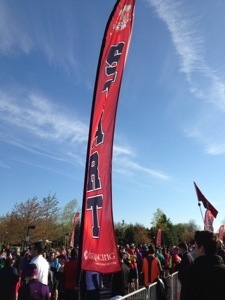 When I woke up on Sunday morning, it finally hit me that I was running a race. I got out of bed at 6:45AM (much later than I anticipated) and rushed to get ready. I scarfed down my breakfast which consisted of a bowl of oatmeal, two waffles, and a small cup of coffee. I kept looking at the time in fear that my stomach wouldn’t properly digest all of this food and I’d vomit all over the course. Luckily, that didn’t happen. I rushed my family out the front door by 7:20AM. Race time was at 8AM and I was starting to freak out. As we approached the exit lane for Busch Campus, we saw that a policeman was already barricading it with orange cones. My heart sank. I have never missed the start of a race before. Panic overcame me and I urged my Dad to find another way in. He took an illegal U-turn. He dropped me in front at the Football stadium, a bit of a hike away from the start line, and my sister came with me to carry my Nike drawstring bag. In fear that I’d miss the gun going off, I fled and told my sister to just meet me by the chute. I anxiously checked my watch every 30 seconds as I looked around for my family. I had signed up for this race on my own, by myself, so it was just me alone standing in the chutes. It was 7:55AM and I got a call from my sister. Her and my parents made it to the starting line and I couldn’t be more relieved. The race announcer began the countdown and a rush of nerves overcome me. I took a deep breath and “Bang”…race time. 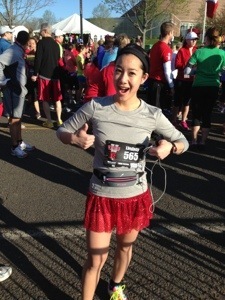 At first, I kept debating whether or not to run with music. For races, I have never ran while listening to music, but for my long runs, I can’t go without it. To keep my mentality that this was just a regular long run, I stuck my earbuds in my ears, turned up the music and let my legs go. I started out really easy. My first mile was only a few seconds under 10-minutes. I gradually picked up the pace over the course of the next 2 miles. I let people pass me and minded my own business. As I got into my groove, I continued to pick up the pace. I was in my own world. It wasn’t until around mile 8 or 9 that I really started to kick into competitive mode. I watched as the runners who frantically sped past me in the beginning miles begin to to fall back and slow down. Once I hit mile 10, my legs started going. 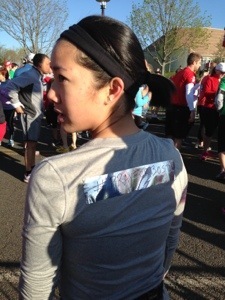 I kicked into 5-K mode and picked off every runner that was in my sight. My familiarity with the course brought little to no surprises as to where this course would end. As I neared the last straight away on College Avenue, where I spent so many of my college days, I was in an all-out sprint and finished stronger than I ever have in any other race. I knew I had so much left in the tank and I felt good about that. I saw my family waiting for me at the end of the finish line and I was overcome with smiles. This race meant a lot to me for many reasons. 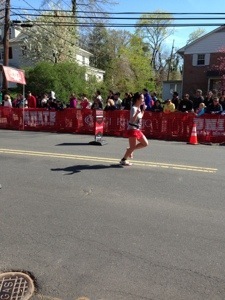 I ran for Boston. I ran as an alumni. 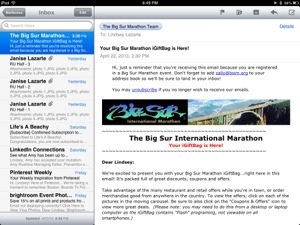 I ran to prepare for Big Sur. 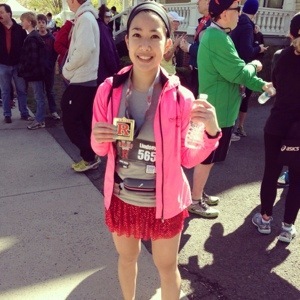 I ran because it’s what I love to do. I ran because it brings me joy. I ran for my family. It’s hard for people to understand why people put themselves through hours of training for long distance races such as these. It’s personal. Everyone has their own reasons, but at the same time, these reasons also bring runners together to form a community. Runners understand each other on a deeper level because of these reasons. 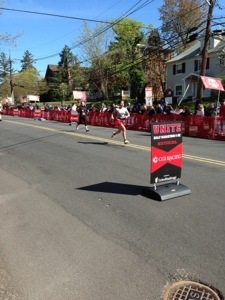 To conclude this race report, my official time for the 2013 Rutgers Unite Half Marathon was 1:46:53. Oh and did I mention I set a PR by 2 whole minutes? Yes, I indeed did! They’re the BEST! Have fun and good luck. I’ll be cheering you all on after my half Sunday. Can’t wait! See you in Cali! I’m not going! 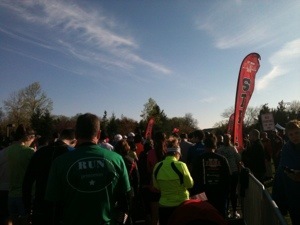 Running a half in the Lehigh Valley. Boston and Big Sur was a lot of work travel in a row last year, so I opted out.